Sydney Hartford, dressed as Dorthy Gale in “The Wizard of Oz,” visits William Cooley a patient at Mercy Health-St. Rita’s Medical Center, Monday. Sydney Hartford, dressed as Dorthy Gale in “The Wizard of Oz,” visits Pat Bolling a patient at Mercy Health-St. Rita’s Medical Center, Monday. LIMA — Patients at Mercy Health-St. Rita’s Medical Center were taken down the yellow brick road after a visit from Dorothy Gale from the Wizard of Oz, Monday. Several patients were surprised throughout the morning when they saw Dorothy walk into their rooms. One patient described the visit as one of the best days of his life. 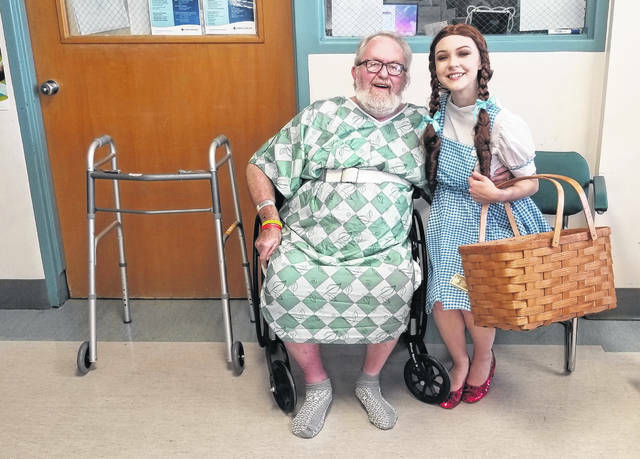 Sydney Hartford, apart of Octopus Productions, a a theater production company in Lima, was excited when she found out that she would be dressing up as Dorothy Gale to visit patients at the medical center Monday. In the 1939 film, Dorothy Gale, a young girl from Kansas, was swept away from her home to the magical land of Oz where she meets new friends who help her return home. “The Wizard of Oz,” which showcases Oct. 27 at Veterans Memorial Civic Center, is a part of a multi-production Broadway show series this year. “We are very grateful that Mercy Health-St. Rita’s will allow us to bring some joy to their patients,” said Jeremy Martinez, director of development at Veterans Memorial Civic Center. 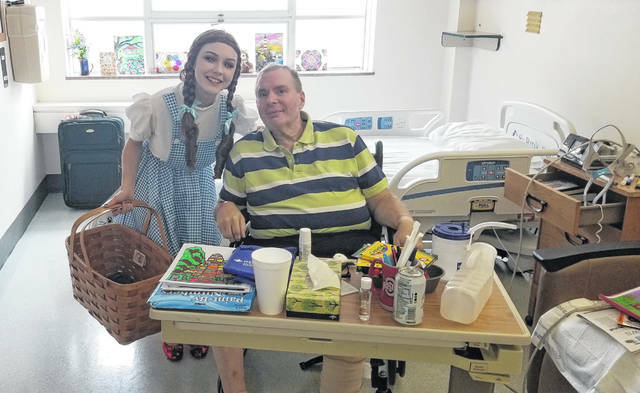 Mercy Health-St. Rita’s Medical Center President Dale Gisi said having Dorothy visit the facility was a opportunity for patients to get their mind off their medical issues and have fun with sharing stories. He also said he was glad to have an opportunity to promote the work of the Civic Center. “It’s very important to support the Civic Center and the other great things happening in the Greater Lima Region,” said Gisi. https://www.limaohio.com/wp-content/uploads/sites/54/2018/09/web1_Dorthy-1.jpgSydney Hartford, dressed as Dorthy Gale in “The Wizard of Oz,” visits William Cooley a patient at Mercy Health-St. Rita’s Medical Center, Monday. https://www.limaohio.com/wp-content/uploads/sites/54/2018/09/web1_Dorthy-2.jpgSydney Hartford, dressed as Dorthy Gale in “The Wizard of Oz,” visits Pat Bolling a patient at Mercy Health-St. Rita’s Medical Center, Monday. Reach Camri Nelson at 567-242-0456 or on Twitter @CamriNews.